Look at it this way: every Year hazza 52 weekends, no matter where youza calls home, youza still got 52 wowza meowza weekends so howza comes ya gotta squeeze all da pawties into 1 weekend with no time to catnap? Catzowey! Me and myself izza exhausticatted cuz I pawtied and pawtied more till my smitten kitten self couldn't pawty anymore. I'ma gonna tell youza how many pawties I went to this weekend but dontcha tell anybody else! It wazza World Cup weekend so I pawtied at da house of my pal Jackpot the Cat and whata Lion King feast he purrpared! Weeza had abundacat internashunal foods frum all over da Globe so weeza was feeling like internashunal mega meowguls. We man cats opticatted fur furont row seats in furont of his giganticat wide-as-we-are TeeVee, but look at Jackpot's face! Heeza shure looking shockaronied (like his Mice a Roni box izza empty). My host just heard our YouEssHay Team lost in da overtime. Shuksatini good reason to be shockaronied!! Trotted my paws into da guest restroom shure I wazza thinking bout resting) and basta pasta itza still under construkshun and no organicat glitter litter laid yet! Itza gonna be a fine feline fancy guest roomy di rest for da next pawty cuz theyza installing a sky light fur viewing when youza pooing. 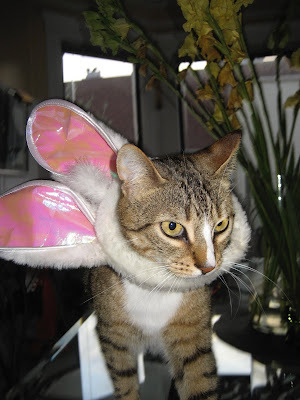 Next pawty was "Tickle Me Pink & Don't Drink From The Sink"! Theyza served pink cupzatini cakes and pomegranate nip Cosmocat cocktails in purrsonal thermoses with yur own feline Flexi straw - that flattened me fur shure! Trekked my tootsies to da next pawty where weeza celebrated YouKneeVerseAll diversity and sharing good times with furiends at The 2010 PRIDE PURRade called "Fabulous and 40". I'ma only 4 and I thinks itza fabucatulous to be 4 so imagine how more fabucatulous it izza to be 40. We pawty animals izza all exactacatically da same no matter what age, cuz we all gotza da same stuff, big loving hearts, luvs to devour chow every hour, and loves our furiends tall and small. After this whirlwind weekend of pawsative Pawties, I electacatted to bag it! And nowza meowza - I wishes YOU a nonCATastrophic week! June 21st iza da Summer Solstice anywhere in da world, and itza fine feline time to be out and about strolling, trolling and rolling around and purrrayzing da ground dat I catnap on - Summer has arrived OhFishYully. Duz youza know about da magical Summer Solstice stuff? Wellza I tellza ya the meowvalous day of June 21st izza da longest day of the whole giganticat Year and itza also da shortest night of the whole giganticat Year! So weeza gotta do da abundacatnaps and shop expedicatically all day long and fast too, cuz weeza being shorted time in da night. reach fur da Sky! Yep Uh Huh ALWAYS reach fur da sky on da Summer Solstice or any day! And be shure yur Stroller izza safe - I strolls in my laundry cart cuz itza clean furesh soft and safe place to sit. Hang on tight when youza rolling and strolling on da Summer Solstice as the power of the celestial seasons (purrhaps the seasonings like Basel, Rosemary & Thyme too) might grab ya off yur cart and youza wanna yur paws grounded fur shure so youza duzn't get airborne in space up up upza with da Summer Sosltice stars. When youza turning the corner youza wanna do a purrfeshonal turn of yur head so youza knows exacticatically what turn to take in the road - furget da rear view mirror and instead use yur meowster mind and cat eyes to be shure da road izza clear! AhTeneeOhKnee! NOWza MEOWza, youza gonna have a funtasticat time on da longest day of the year! Be shure you duz something extra cuz youza got extra seconds during the day now. Yep uh huh itza fur shure youza gonna have a nonCATastrophic June 21st 2010 Summer Solstice! Every purrson around da world is jumping up and downza and going thru da hoops (oopsatini thatza Basketball catchat! ), cuz itza WORLD CUP time. Every day at my house izza da day of the Cup so I'ma not shure what all the buzz izza bout fur just 2 weeks of the Cup. But being a sports enthusicatist, I dusted off my World Series ball - cuz I duzn't have a World Cup ball (yet). Yep uh huh I'ma in da knockit socket sprocket Soccer mood now and purracticing to play. The mewspaper says dat da purrfeshunal Soccer players stretch alot befur a game - itza speshully good for da meowscles. Using furont paws in Soccer will get ya booted out of the game and into the Litter box! In England datsa called "going into da wastebasket". Duz you believe these giganticat Soccer players can fit in a wastebasket? Goalies got it ruff and tuff cuz they gotta leap way uppa in the air to stop dat speeding ball but Goalies can use da paws. If youza gets into a ruckus with other players using yur paws and elbows, itza called "Chicken Wing Battle"! Holy Cannoli - our Brit pals never ever seen a real battle over da chickie wings - itza called Dinner's ready nowza! Catzowey! Youza wondering "Who's Behind Those Star Studded Shades" and SirPrize itza me! When my Staff of impurrted EyeTailYun deeziners renovated The Guido Gazette pages, I hears "Guido it'za so nice and bright" so me and myself izza looking at it thru da sun glasses. I wanna hear frumza YOU bout what YOU thinks of da colorful summery notza wintery pages. Yep uh huh, I'ma listening - the Staff's not but me and myself izza listening to youza, yep uh huh itza fur shure! Here's to a nonCATastrophic sensayshunal week! And I hopes your Cup izza always full, not just during the World Cup, cuz life izza ball! Is it Tales of The City OR Tails of 2 Kitties? Life can be infurior if youza missing loving da life. Yep uh huh my global cat self sez life izza all about da love and lovely stuff. Fur example so youza gets it: here's me and my little brofur YOLO (heeza not lovely, he's huge!) but weeza hanging out doing da brofurly thing - lovin' da bird watching together like da birds of feather. Weeza wrapped up having a funtasticat time- together furever cuz weeza Brofurs and luvs dat! Being da politicatically correct Envirocats dat weeza is, Yolo and Me and Myself wanna be shure da birdies outside are purrtected and safe fur us to gaze upon, so we checks up close and consistacatically, like weeza on da 24/7 aviary purrtrol! Itza highly recommended youza stretches the meowscles to the meowximum to get the bestest iMax view when working on aviary purrtrol. Often, yep uh huh, like abundacat times, weeza Brofurs takes a break from da Birdie watch work and weeza duz a session to stretch our meowster legs. We do a little Tai Cat Chi, some downward dog Yoga pawzishuns and dontza furget da jaw exercises izza all Catzowey good to keeps youza in tippity toppity Catzowey shape. Birds flying by in purrfecto formashun, spring's almost gone, and I'ma welcoming Summer and nothing more meowvalous than almost Summer lunch with furesh summer corn - I luvs kicking back with my favorito Corn on da Nip Cob. Youza can come to visit me in San Franfuncisco and enjoy my stuff, OR yep uh huh, youza can get one or two or a cousin's dozen from "Cat Faeries". Itza da nachural organicat Nip and not geneticatically altered and no additive phony bahloney stuff (itza gotta be EyeTailYun Purrrciutto not bahloney any hooza!). I luvs my toys from the CAT FAERIES BOUTIQUE and good news and mews, theyza ships to me and youza tooza! Tell em youza FOG 'Friend of Guido" - and theyza ships yur toys fur miles with abundacat smiles. Heads up cuz itza Tails weeza seeing! That Corn on the Nip Cob izza purrfecto and I don'tza feel corny. Itza reprieve from our creature of habitual meowments. Oh I luvs a diffurentiating day filled with doing stuff I loves! Mille Meowster Grazie tooza Cat Faeries for da Corn on the Nip Cob purresent! NEXT week I'ma trying their Catnip Mist Eau Du Toilette. Now, I wantza you to have da mostest fabucatulous and nonCATastrophic week! If youza gotta toss a coin up in da air and call "heads or tails" go fur da terrificat Tails! Catzowey! Meowmorial Day izza 3-days Holiday, no work just catnapping and itza da giganticat day in May when purrsons gives pawsative thanks to our Veterans. Yep uh huh, it's fur shure, there are abundacat Veterans who duzn't have da 9 lives like my meowster self. 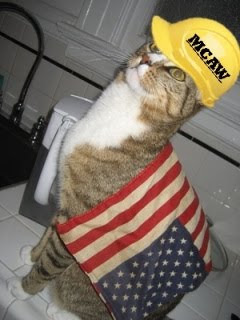 So I stopped, and took a meowment of silence to holds da Flag high on May 31st, 2010 (in betweens purrparing my Barbeque), to purrraise the fallen Veterans and give my abundacat thanks and 4 PAWS UP to the increducatulous purrsons whooza serving our World today. 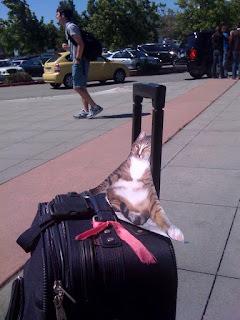 Meowmorial Day in the YouEssHay izza 3 day holiday which means weeza unravels and travels to get to the Barbeque and good foods and good furiends and good furmilies. 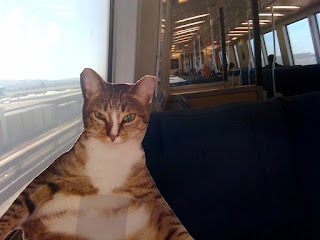 So here I am on da Train heading out of San Franfuncisco. When me and myself got tooza da train stashun, nobody wazza there to meets and greets me, so me and myself wazza sitting firmly on da baggage purrponding when da ride would arrive. Shhh dontcha tell, but da baggage wazza filled with da Barbeque ribbies and speshule impurrted BBQ Nip Sauce from New OhLeans, to put on da Meowmorial Day Barbeque. Inspectacatting da Grill can get yur paws terribly sooty, sooooo whatza to do now? Head to da shwimming pool (I packed the Guido Speedo in my baggage!) to getza da sooties stuff off da paws! Youza dives into da pool, duz a little frog stroke, dives back out with a back stroke and relaxacatza in da Chaise after a dippity dive and voila, da contentacat and clean you survives! And youza so squeaky clean now fur da Meowmorial Day Barbeque - everyone izza gonna ooohs and ahhhhs and stare at ya like youza Celebricat! Anytime during da Meowmorial Day Barbeque izza catzowey time fur a good Catpuccino, (speshully after falling into da nitty gritty grill) so I'ma purressing down on da coffee masheen to make shure the EyeTailYun java comes out into da cuppa justa right .... in da purrrfecto strong style we EyeTailYuns love. Without a doubtacat, me and my smitten kitten self izza advocat for giving da fantasticat service, cuz I'ma MCAW - "Man Cat At Work". So here's tooza all da Veterans around the World, cuz, yep uh huh youza been working at giving da service for more than all my 4 years on da Planet. And befur I begins my week, I wanna say Mille Meowster Grazie to YOU for the abundacat wonnerful "Happy 4th Birthday Guido" wishes last week. I'ma overwhelmed by da outpurrring of cards and gifties and great donayshuns to Pets Are Wonderful Support all in my name, and I thanks youza frumza every side of my EyeTailYun loving heart.